Glyn stated he wanted to use a Feral Ork "Orkeosaurus list", but I didn't realise quite how literally he meant that! 3 Steam Gargants, 8(!) Orkeosauruses with Wildboyz mobz, plus a handful of Madboyz and that was his list! I have 5 Orkeosauruses which is normally plenty - but with 8 required some toy dinosaurs had to substitute for the remaining three. 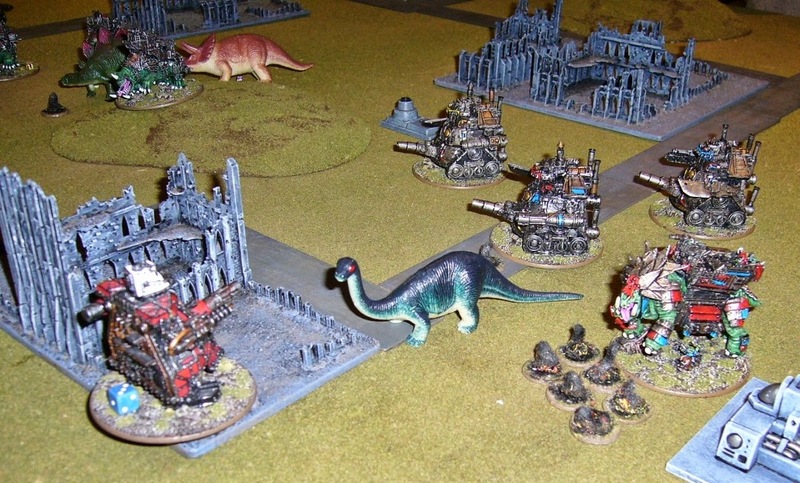 Back row from left to right, is "Bronty, Steggy and Tricksy" (Brontosaurus, Stegadon and Triceratops) and then the old Specialist Games Orkeosaurus model. Middle row are four old Forge World Orkeosauruses, and front row the Specialist Games Steam Gargants. Actually some of the best Orkeosauruses I've seen have been converted from toy dinosaurs... but these are straight out of the box and rather tacky looking... never mind, they do the job for this game! Here's the setup, with a line of Ferals in the distance. 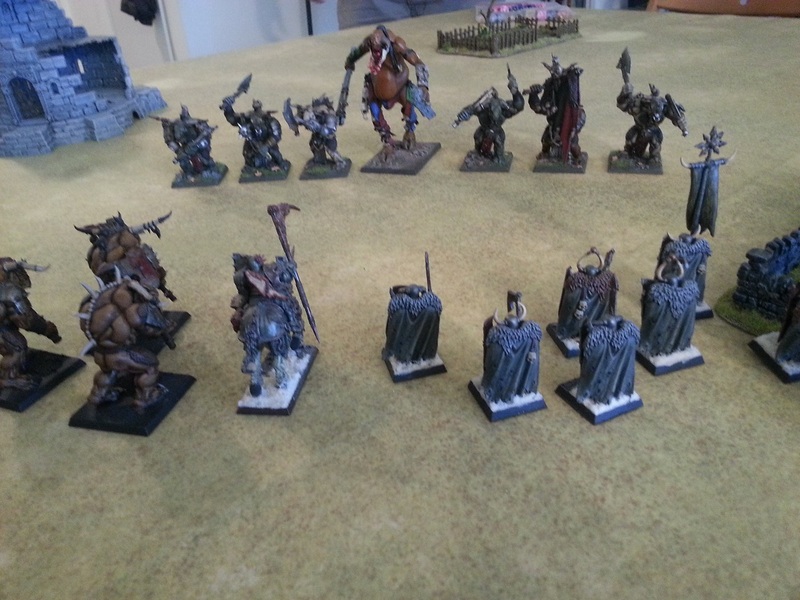 My orks line up with 3 Stompa Mobs garrisoned forward and the remainder further back. 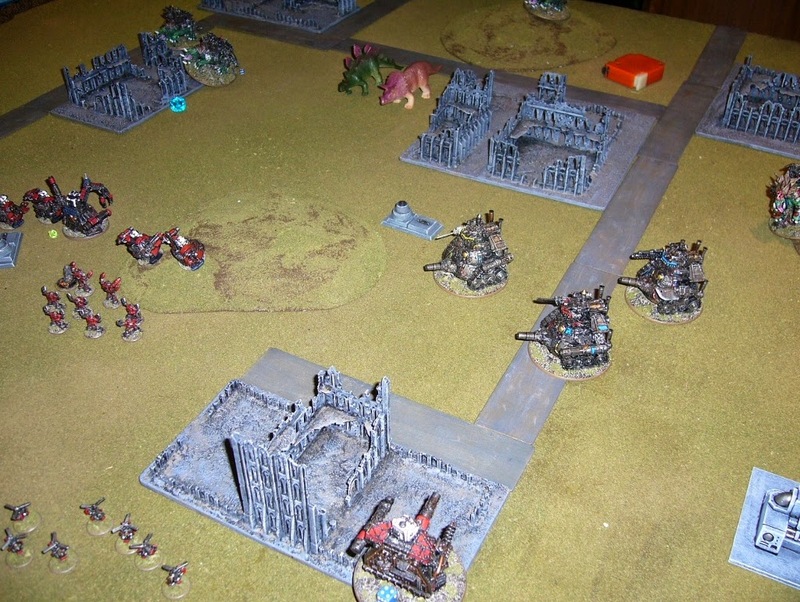 The Ferals win the Strategy Roll and advance the Steam Gargants who fire at two garrisoned Stompa Mobs, killing a Stompa. 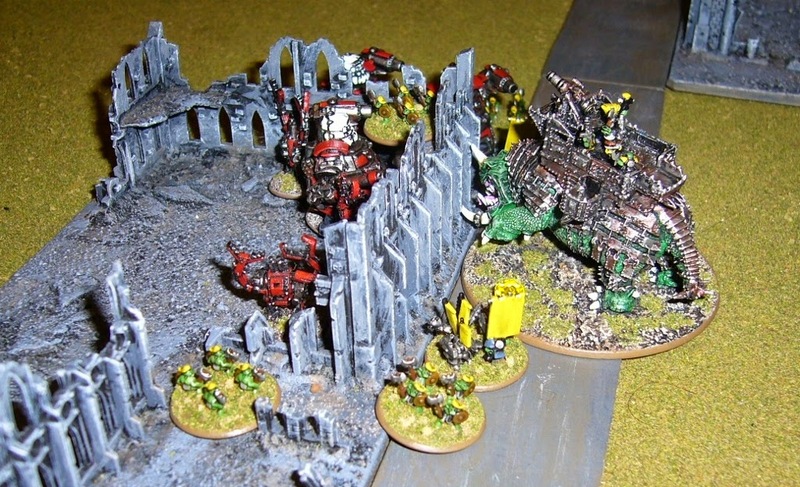 Both sides advance, sadly I miss with my Titan Killer Zzap guns on my Supa-Stompa and Gargant. These need to start hitting if I'm going to have a chance here! My aircraft damage one of the Orkeosauruses, 2 damage, 4 to go. The Orkeosaurus also panics and stampedes into the river, but being big doesn't have to make a dangerous terrain test. 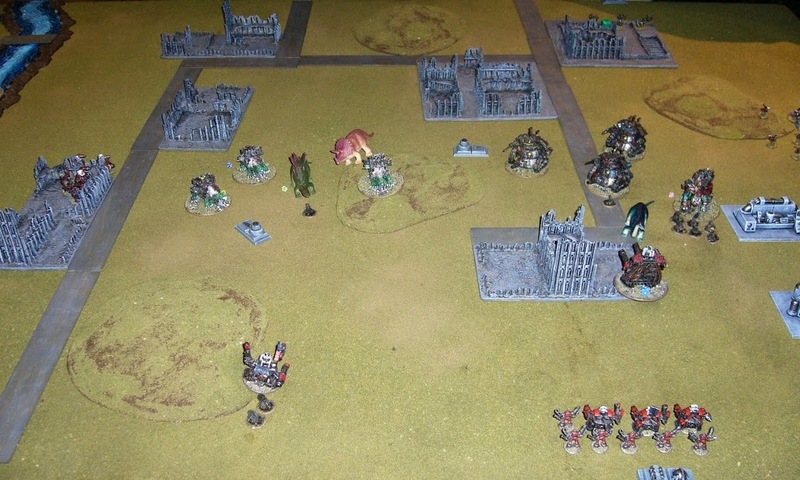 Ferals win Strategy Roll again, and the Steam Gargants continue their advance, doubling and blasting a Stompa Mob, but missing and only placing blast markers. The Orkeosauruses stampede forward faster than I can take photos. 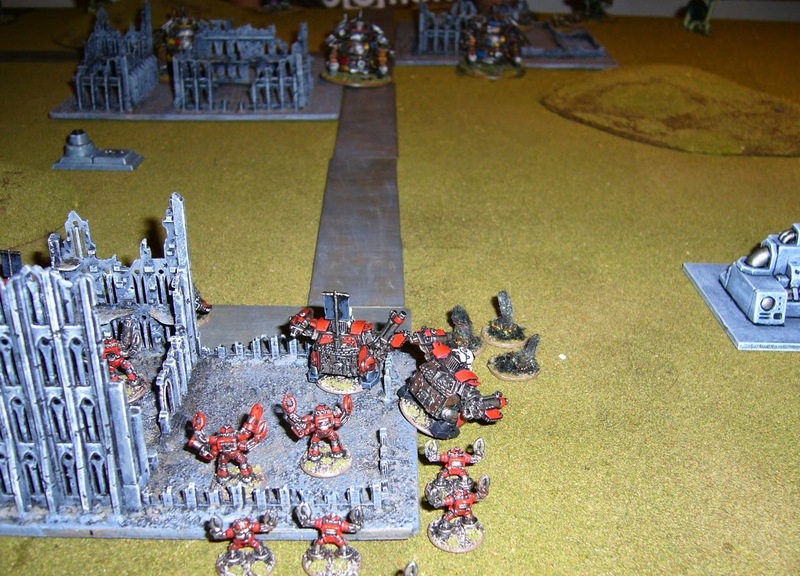 Some take heavy damage, including from crossfire, but they smash through my two Stompa Mobs in the centre. My cause is not helped by one of the wounded Orkeosauruses stampeding towards me even faster as a result of it taking a critical hit! 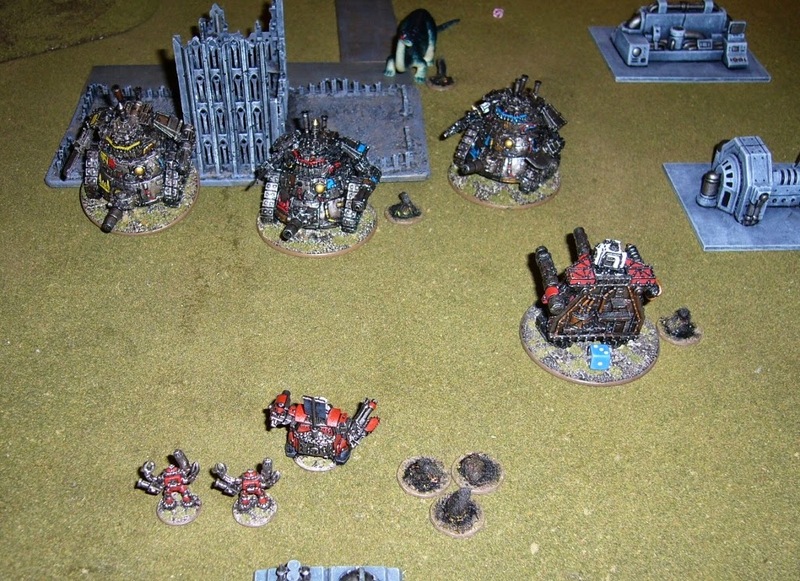 I lose all my Stompa and other armoured walker units here except for the Supa-Stompa, which retreats back! My aircraft do another two damage to an Orkeosaurus. 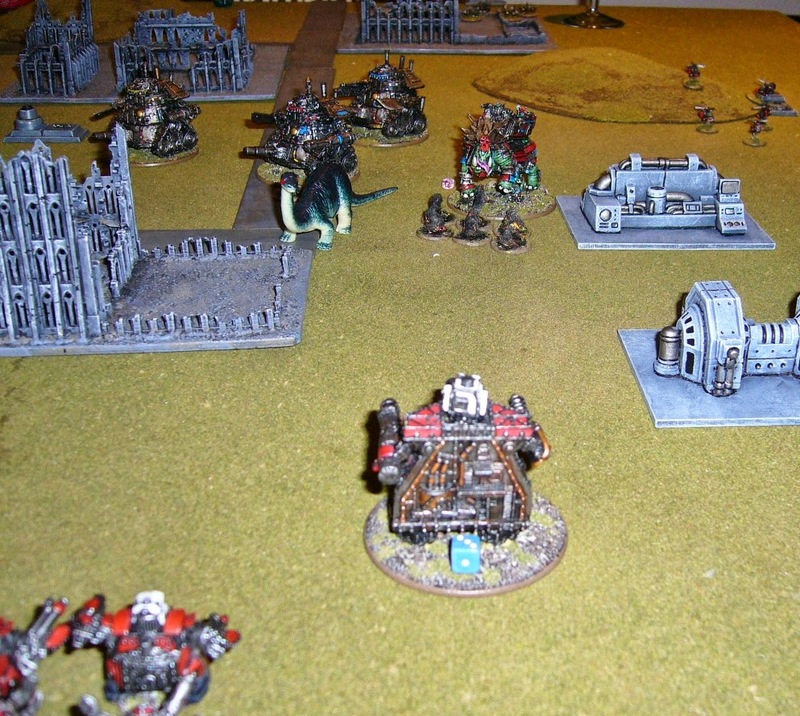 My Dethkoptas double around behind the Feral left flank, crossfiring an Orkeosaurus to no effect. I win the Strategy Roll this time, and my Gargant steps back a move before blasting and killing the Feral Warlord's Orkeosaurus and all it's crew including the Warlord himself! 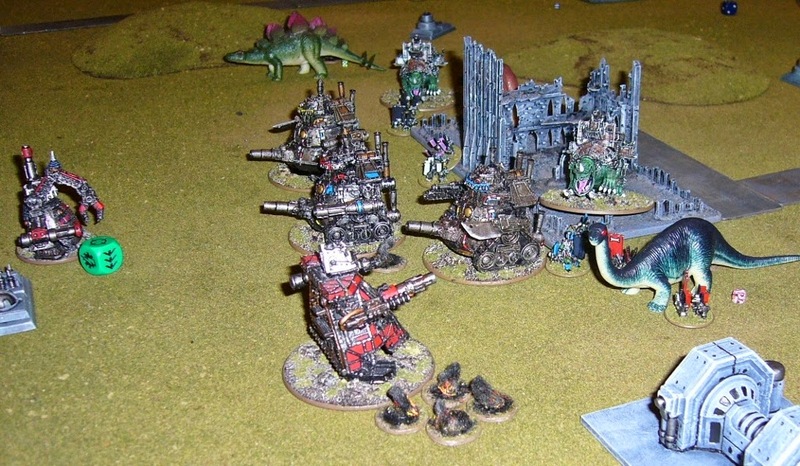 My Supa-Stompa then opens fire wounding more Orkeosauruses on the other flank, but failing to kill any. The Orkeosaurus assault begins. On my left flank an Orkeosaurus unloads it's Wildboyz and assaults my Stompa Mob here, wiping them all out taking few losses in return. The Orkeosaurus is only on a single damage point remaining but that is little compensation to my destroyed Stompa mob. 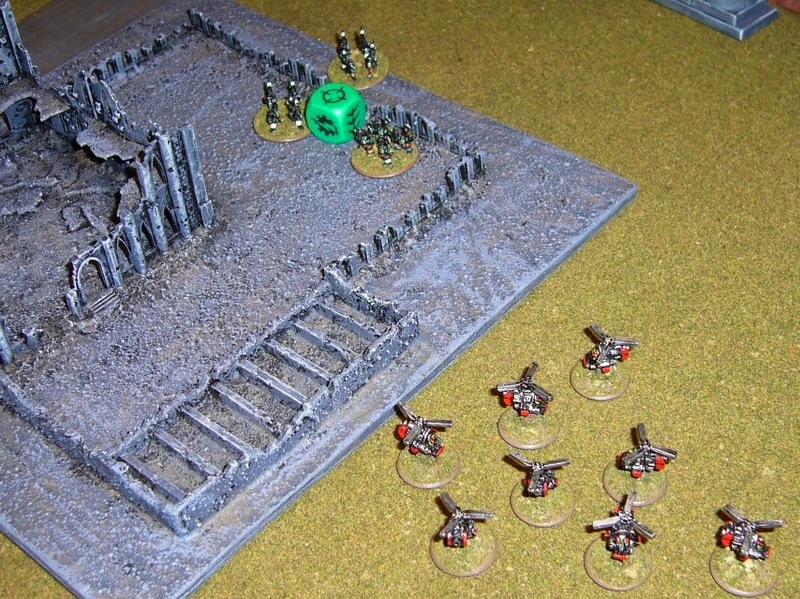 My Deth Koptas charge onwards and break the Madboyz, and capture the Feral Blitz objective. But too late, my Gargant is broken in a firefight by more Orkeosauruses with support from the Steam Gargants. The Feral ladz win 2-1 with Blitz and Take and Hold Victory Conditions. My Stompas got stomped! My advice - stay out of the way of multiple charging Orkeosauruses. Just stay away! 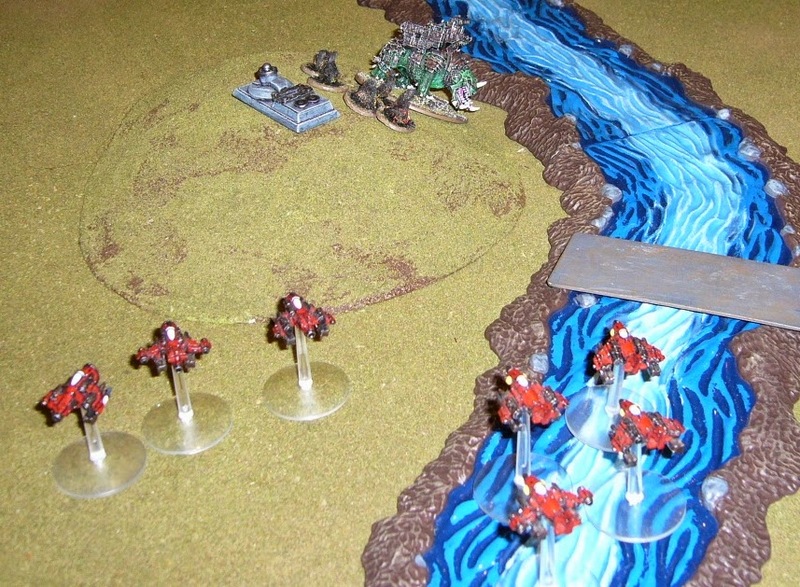 Unfortunately my equally slow moving army really had problems doing so in this game, combined with the fact that my Zzap guns failed to live up to the promises of the mekboys. Steam Gargants are quite fragile and have a nasty habit of exploding catastrophically, but I couldn't get the hits on them this game! Anyway another interesting and bizarre game of Epic with curious army selections. Good times! Ha! Very amusing - stampeding toy dinosaurs! Excellent! !